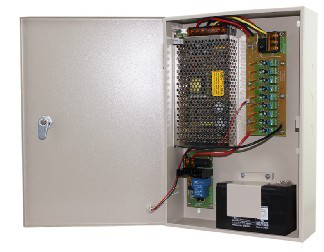 CCTV Cameras Power Supply Unit with Backup(UPS) 12 V 10 A DC9 Channel power supply box for surveillance camera systems. Each channel is individually fused at 1.1 amp DC each. 10 Amp DC total output.With battery 12V7AH for emergency function. General Protection: each output has individual PTC fuse and LED indicator, when problem occurs,only affect the individual output, other outputs still working. Circuit Short Protection: when short condition occurs, individual PTC fuse will open the circuit,when condition removed, PTC fuse will automatically back to close. High Voltage Protection: when high voltage occurs,the surge protection will be hit through to protect the connected device. then switch back to normal. when normal condition,PS will provide volatege and charge for battery automatically,charging voltage will be 13.0-13.6V DC. no provide power for the load, in order to protect battery life. the load will stop automatically,no provide power for the load again, in order to protect battery life. Widely apply for CCTV Camera, PTZ, IR Illuminators, Video Process Equipment,etc.Access Control Reader,Lock,Panel,etc. 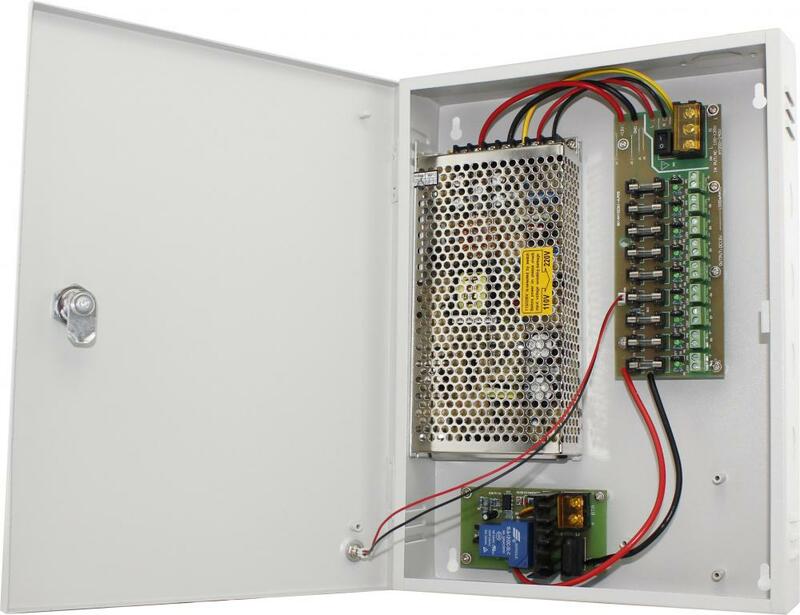 Looking for ideal 12vdc Power Distrubution Box with Battery Manufacturer & supplier ? We have a wide selection at great prices to help you get creative. All the Cctv Power Supply 12VDC are quality guaranteed. We are China Origin Factory of 12v Backup Power Supply for CCTV. If you have any question, please feel free to contact us.